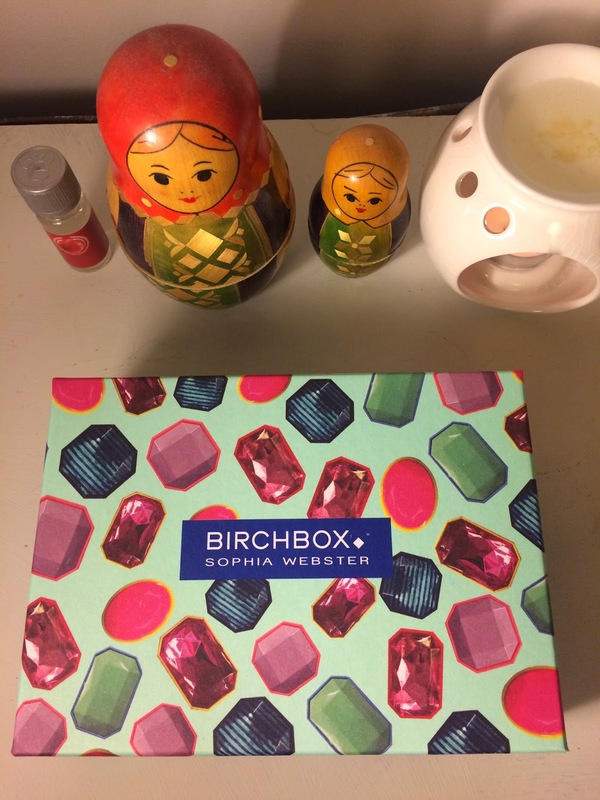 Thought I'd share with you my first impressions of this months December Birchbox! My box arrived this morning- rather early for once... and what a nice way to brighten up my monday morning! This months theme is "Put on your party shoes!" a collab box with accessories extraordinaire Sophia Webster. The box itself is decorated with beautiful,what i like to call, chintzy jewels. I love the collab boxes as they have a bit more of a treat feeling about them- this one on first impressions hasn't let me down. Me and the Mr have a strange little routine on the day my box arrives... he enjoys the element of surprise to the box idea (NOTE- Birchbox please bring out a regular monthly mens box!!) so he opens it and hands me the items one by one so that i can enjoy each item. He's one of those people who, if it was his choice, he'd wake up on xmas morning and not open any presents until lunchtime and do it slowly- one for mum, one for dad, one for me..and so on... I HAVE NO PATIENCE for that but thats why we work well together :) anyway.... so once he's handed me an item the first thing i usually do is give it a sniff; regardless of whether its a fragranced product or not and have a quick test. Im obsessed with smells so if something smells yummy i'm usually bought in by it! Sophia Webster Purse £25- Love this cute little coin purse- I love pastel colours and I'm not offended by a print here and there. Good quality fabric and love the contrasting striped detail on the back.. - Mr's comment- "something you can put all your bloody bank and loyalty cards in"- we quite often have the 30 second panic of lost bank cards at Tescos! 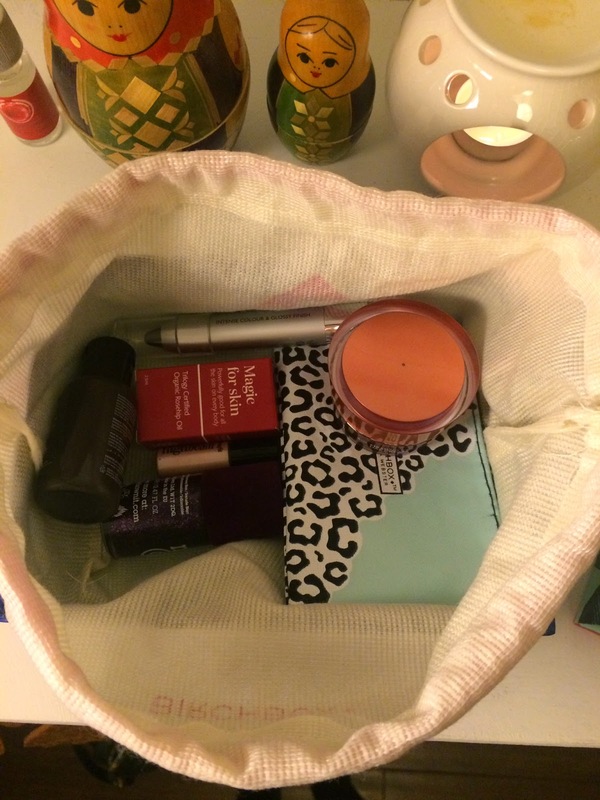 I do have a purse of course but a huge one with too many places to lose stuff in! 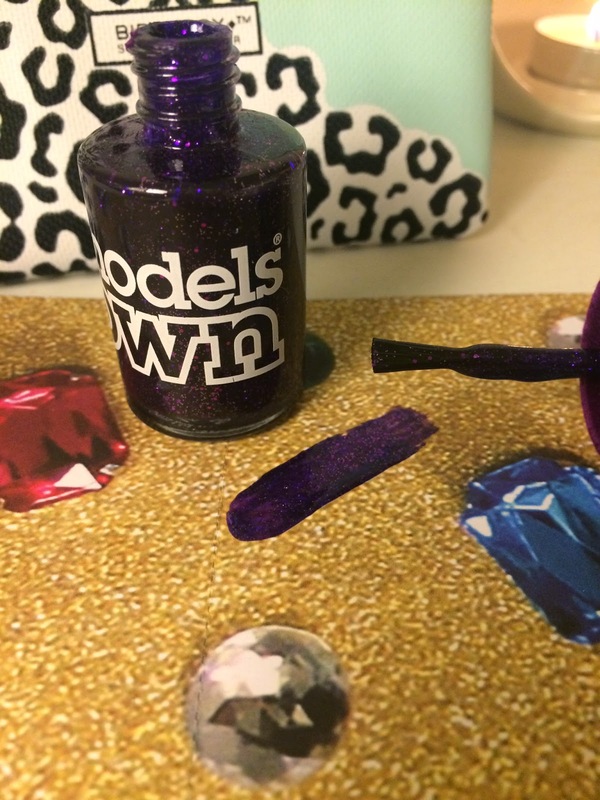 Models Own Amethyst NP177 Nail polish (Full size!) £5- Some nice sparkle for the festive season of course! I must admit I'm not usually taken by glittery varnishes- I feel I'm a little too old for sparkles but I do quite like this one. Its a matte finish deep purple with tiny specks of silver and purple glitter. My only dislike to this product is the lid. Yes I'm weird but I'm sure someone else out there has this irrational dislike too... the lid is COVERED in a velvety fabric.. velvet goes right through me so I had to ask Mr to undo the lid for me. Am i weird? Trilogy Certified Organic Rosehip Oil (2.5ml sample- full size is £16.50)- This teeny little box contains a teeny little pipette bottle of Rosehip oil. I've tried it today on the back of my hand and it leaves your skin feeling lovely and soft. The smell is very subtle but has a bit of an christmassy smell to it- just googled it and Rosehip features in lots of xmas potpourri so thats probably why it reminds me of my favourite time of the year! It says on the packaging to use all over- from your face to feet.. Im going to keep this in my handbag for those times when my skin is screaming out for goodness! Really happy with this sample- something I wouldn't usually buy but glad I've got an opportunity to sample! 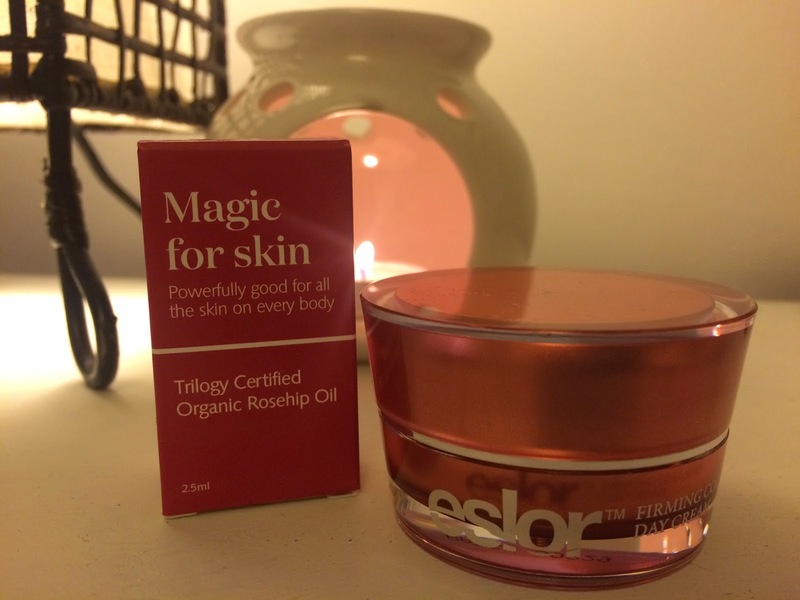 "Started using this product and within two days my face looked so much firmer whilst being smooth and moisturised"
So this little pot of what sounds like magic has a lot of promise! I'll keep you updated if it turns out to be the answer to all my beauty wishes- who doesn't want smooth, moisturised and dewy looking skin eh! Electric Hair Hydrate Shampoo (30ml sample- full size £17.50) Smells.. shampooey.. its hard to pass comment on this as I haven't used it yet! The sample size is a bit teeny.. I like to sample things at least for 2-3 washes before I spend anything substantial on products when it comes to shampoo- my hair doesn't agree with lots of different shampoos .. so I'm not sure how I'll get on with this. Probably about 2 washes at a push but i'll give it a go. Eyeko Fat Eye Stick in Smoke(full size £8) Not sure I'm taken by the name.. but the texture of this creamy thick crayon appeals to me. I've tried it out this evening on the back of my hand and washed my hands a few times and its still there.. immediate points from me. I have issues finding eyeliners that don't d-r-i-p down my face by lunchtime! The info cards in the Birchbox provide a tutorial for smokey eyes using this fat stick (sounds so weird).. perfect for the office xmas party! Last but not least... one of my all time favs from Benefit- a cute mini sample of Highbeam- I've already got a full size of this and I know a lot of you probably have too. We all love it yes?! This little one is handy to pop in your handbag for a night out- I don't like taking my full size out as I'd either A)smash it in my bag leaving a pretty, shiny but sticky mess behind or B) lose it in a drunken state. So what do you think of this months samples from first impressions? 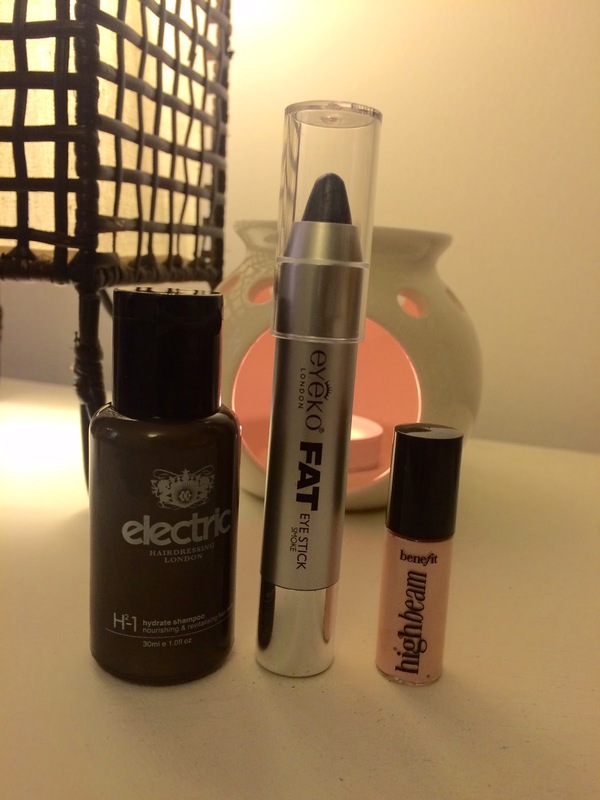 Im happy.. although a little xmas choccy wouldn't have gone a miss Birchbox.. I love the edible lifestyle samples! If you haven't signed up already what are you waiting for?? Use this link to get some £'s off for both of us- a little xmas pressies for us both! Its my birthday next week so keep an eye on my blog for more posts about some of the lovely gifts I receive.. 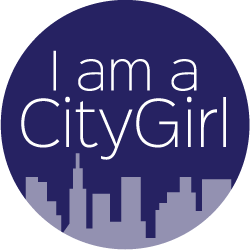 I know I like being nosey at gifts so thought I'd share mine with you!